Fifteen years ago I was a few weeks into my student teaching experience in Charles City, Iowa. I spent my mornings directing high school vocal music and the afternoons in an elementary school general music classroom. I went into that experience fairly certain that music would never be my primary vocation. I had a sense that congregational youth ministry or seminary would be my next stop. Music education (specifically choral conducting) was, at that time, the back up plan. Though my primary vocational identity for the past 14+ has been in youth ministry, I've continue to make music part of my life. I occasionally worked as a vocal music substitute at a local high school. I played guitar for children's ministry events. I led a "praise band" for a few years. There's always music being played or sung in our home. But I haven't really done the thing I was trained to do in college -- be a choir director. That's going to change tomorrow. One of my duties at my new church is to direct the choir. 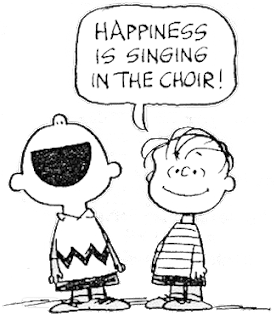 Thinking about choir rehearsal makes me feel like I'm 21 years old again, getting ready to embark on another day of student teaching. Excitement. Terror. Curiosity. Humility. Back in college, I'd squelch these feelings with frozen pizza, cheap beer, and Super Mario World with my roommate. Tonight, I'll settle for West Wing reruns on the couch with my dog. It's a bizzare thing to be in front of a group of musicians...a strange mix of intimacy, vulnerability, and passion. And it's a profound honor. Which is something I hope I never cease to recognize.